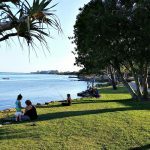 Visitors heading to the beautiful Sunshine Coast are spoiled for choice with so many great options of places to go, stay, see and do! Our family was excited to be headed North and after our daughter Ashlee inherited some hand-me-down Bindi Irwin books there was no option but for us to be destined straight for Australia Zoo. As a family with young children, for us, proximity is everything! 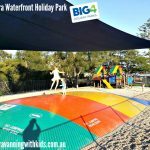 With limited time and knowing the journey would be long we knew we needed to base ourselves in a holiday park centrally located to Australia Zoo and the beach but also with a pool and playground for the kids. 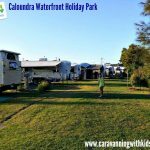 We researched the options on Wikicamps and Caloundra Waterfront Holiday Park appeared to tick all the boxes. 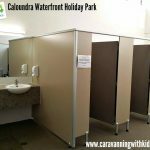 Many caravanning families are not fussed about customer service as long as the facility is clean and meets their needs however when we called Kim to book (Caloundra Waterfront Holiday Park) we could not have been more impressed! Personally I love great customer service and Kim’s warm, friendly and professional approach set the tone for a great stay ahead. On arrival we discovered a large check in area perfect for our long rig, a lovely reception and a broad smile from the ever-helpful Kim. 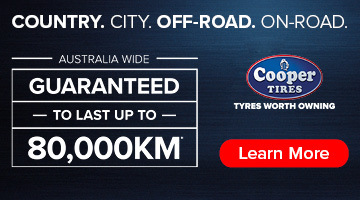 It was invaluable to chat with Kim, as she was an expert source of information for us – especially on how to make the most of the area on limited time! As we moved on to set up the van we were immediately pleased to find a spacious site, manicured gardens, matting and plenty of room. 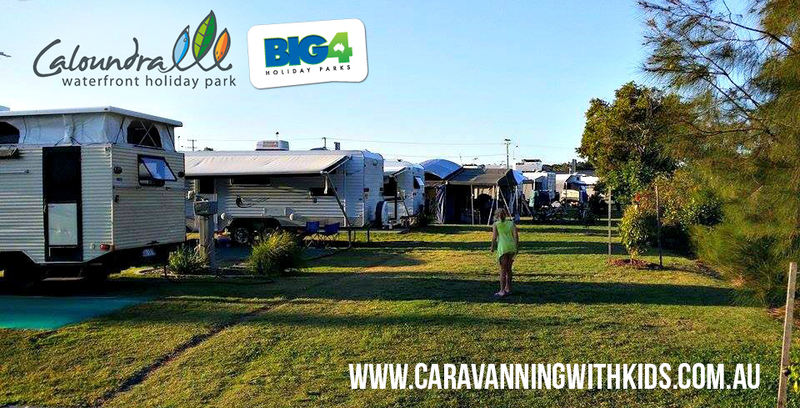 The site was adjacent to the water and boasted a large grassy area – it was truly like we had our own backyard! As soon as we were parked and set up it was straight to the pool! 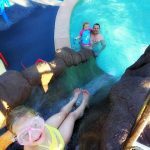 The screams of excitement were deafening, the kids had realised this wasn’t just a pool but there was a… waterslide! (10/10 Mum!) 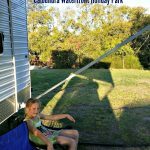 Coming from regional Victoria a waterslide is not an every day occurrence in our children’s lives so this was an incredibly exciting discovery for them – and oh what fun they had. The pool was sparkling clean, heated (cool, not hot) and very inviting! There was comfortable, quality plastic furniture for parents to relax on and an outside shower and toilet, both which I appreciate for convenience and hygiene. The gardens were very well maintained (No prickles Mum!) and the facilities were clean, new and modern. Many of the trees are young so in a few years time there will be wonderful natural shade however in the short term there is more than adequate relief from the sun around the water’s edge, pool, jumping pillow, playground and BBQ areas. As parents were we felt the high level of security was impressive. 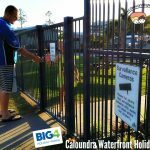 In busy holiday parks gates on arrival, gates around the park, security cameras and key only access is added peace of mind. 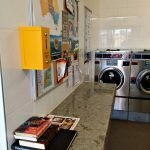 I also loved the homely touch of a few reading books in the laundry room – as people who frequent many holiday parks it has to be said the unexpected touches are always the most memorable! 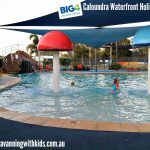 There are so many reasons why the Caloundra Waterfront Holiday Park was a big tick for us! We must also mention the quick stroll to the beach (awesome! 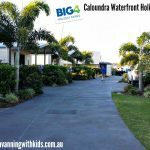 ), the smooth paved walkways and driveways (perfect for scooting and riding), the gorgeous boardwalk around Caloundra to Kings Beach (perfect for the kids with bikes or scooters), the yummy fish ‘n chips just across the road and extensive amenities to meet all our needs.